ORDERS PLACED BEFORE 1PM DISPATCHED THE SAME DAY! 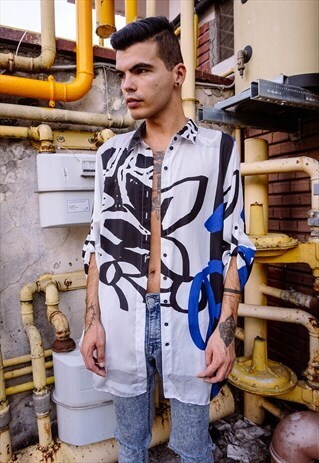 Model is 5''8 / 1,73m and wears a Size S. The shirt shown is an estimated size L. It incorporates the white part with the buttons plus the colorful part above it. CONDITION: Excellent. Natural signs of wear as expected with vintage items. Returns accepted within 14 days of purchase. If you have any questions regarding the item please feel free to drop us an email. Be sure to click follow in the header of our boutique to see new stock first. Check out TipsyGipsy.Me on Instagram for updates.